What is it about cookie dough that everyone loves? 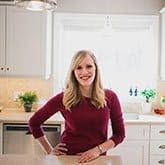 I remember as a child consuming my fair share of cookie dough while I was supposed to be baking cookies for my mom (and as you already know, my Mom’s Chocolate Chip Cookies and my Mom’s Double Chocolate Chip Cookies are the real deal). As I grew up though, I kind of stopped indulging in that forbidden treat. I’m not sure why — maybe it was me trying to be a responsible adult in front of my children (also the reason I stopped chugging milk from jug immediately after). I’m happy to say that although this cheesecake is totally indulgent, there are no raw eggs or any of that jazz that starts to concern some people when you mention consuming cookie dough. It’s all perfectly safe and incredibly delicious (if it’s a concern of yours, follow the instructions below to heat treat your flour)! 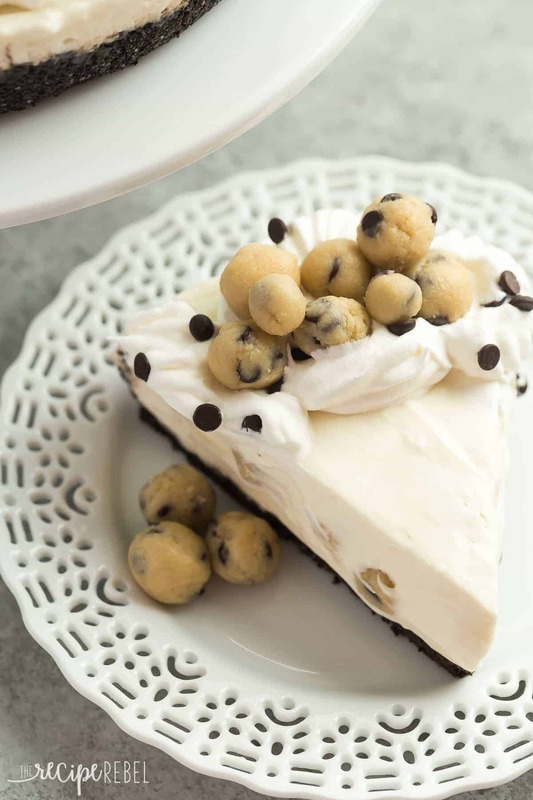 There is a layer of cookie dough under the cheesecake, cookie dough balls mixed throughout, and a pile of cookie dough balls on top — so it’s perfect with a cup of coffee (or tall glass of milk)! NOTE: Consuming raw flour is not recommended by the FDA. If this is a concern of yours, follow these instructions to heat treat your flour before making the recipe. 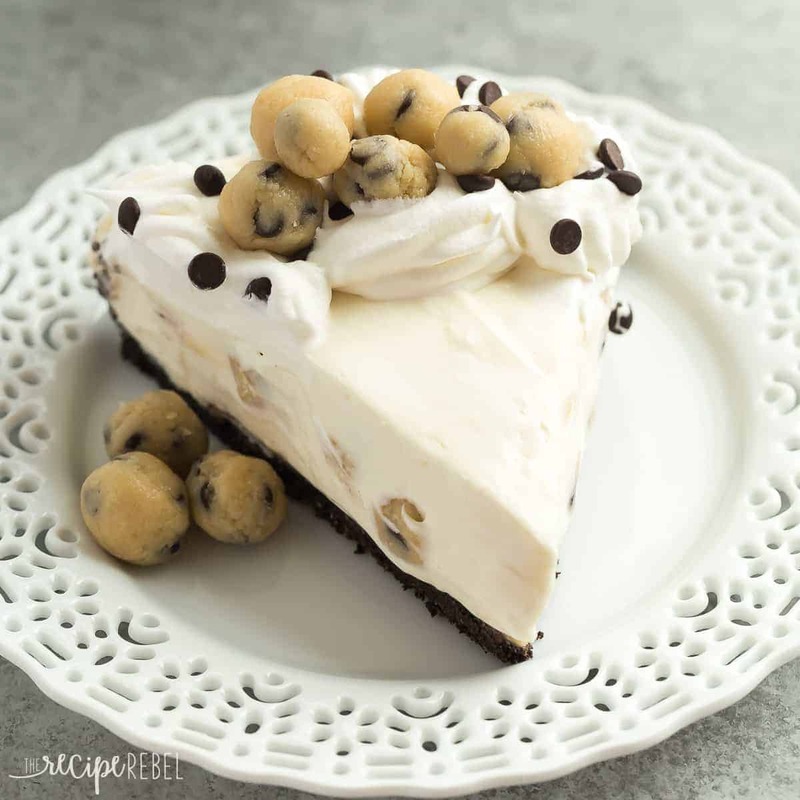 Everyone loved this NO BAKE Cookie Dough Cheesecake -- it's made with edible cookie dough and an Oreo crust and is an extra special dessert for the holidays! CrustCombine melted butter and cookies in a food processor and process until smooth and a ball forms. Press into a 9" Springform pan (or a pie plate or square pan works just fine, too!). Cookie DoughIn a medium bowl, stir together softened butter and sugar with a spoon. Add salt, vanilla, milk, and flour and stir until a dough forms, adding a little more milk if needed. Stir in chocolate chips. Set in the refrigerator to chill. CheesecakeIn a large bowl, beat together cream cheese, cream, sugar, and vanilla until completely smooth and fluffy -- about 5 minutes on high speed. Divide the cookie dough in thirds. Roll 1 third into a circle the size of your pan and lay on top of your crust (I do this between 2 sheets of wax paper and it works perfectly!). Roll remaining ⅔ into small balls. Stir half of the cookie dough balls into the cheesecake, and set the remaining in the fridge for garnish. Top with cheesecake mixture and set in the refrigerator to chill until set, at least 4 hours. Garnish cheesecake with whipped cream if desired and extra cookie dough balls. Serve and store leftovers in the refrigerator for up to 5 days. 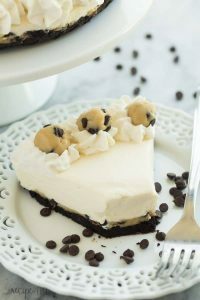 Everyone loved this NO BAKE Cookie Dough Cheesecake — it’s made with edible cookie dough and an Oreo crust and is an extra special dessert for the holidays! Combine melted butter and cookies in a food processor and process until smooth and a ball forms. Press into a 9″ Springform pan (or a pie plate or square pan works just fine, too!). In a medium bowl, stir together softened butter and sugar with a spoon. Add salt, vanilla, milk, and flour and stir until a dough forms, adding a little more milk if needed. Stir in chocolate chips. In a large bowl, beat together cream cheese, cream, sugar, and vanilla until completely smooth and fluffy — about 5 minutes on high speed. Divide the cookie dough in thirds. Roll 1 third into a circle the size of your pan and lay on top of your crust (I do this between 2 sheets of wax paper and it works perfectly!). Roll remaining 2/3 into small balls. Stir half of the cookie dough balls into the cheesecake, and set the remaining in the fridge for garnish. 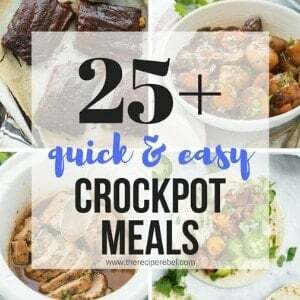 Such a lovely recipe!! Will have to say to anyone who wants to follow this recipe: MAKE SURE YOU HAVE AN ELECTRIC WHISK!! It took me so long to hand whisk it and I didn’t achieve the right consistency, I went with it anyway 😂…hence it collapsing after being in the fridge for more than enough hours! Yes, an electric mixer is definitely key here to getting it nice and thick! I’m glad you liked it! Can this be made without using chocolate? I can not have chocolate and love cheesecake. I was thinking golden Oreos and butterscotch chips. Do you think it would work? I think that would definitely work! I bet it would taste great! I just finished making this for dessert to go with Christmas dinner. Since I was pressed for time I used a no-bake cheesecake mix and folded the cookie dough into the batter. My issue was with the cookie dough itself-it was rather sticky and I had an extremely tough time peeling the wax paper off once I placed the dough on top of the crust. Rolling it into balls proved to be challenging-it stuck to everything! It was actually pulling the crust away from the pie plate as I was attempting to peel the wax paper away from the dough. I put the pie plate in the freezer for 15-20 minutes and that seemed to help. Not sure how its going to taste but i thought i would share my feedback in case someone else has issued similar to mine. Thanks Suzanne! The cookie dough is definitely easier to work with when chilled. This looks so good. I love anything cookie dough. I can’t wait to try this! Yum, thanks for sharing. Do u have to use a beater? You wouldn’t have to if you can whip it by hand, but it will be tough! Does it have to be kept in the refrigerator? Hi Tara! It is a softer cheesecake, but it should hold up like it did in the photos and video. Did you use 35% cream and not a lighter version? Do we take the cream out of the cookies before making the crust, or leave the cream in the middle of the cookies? I don’t have a food processor big enough how else could I make the crust? Place the cookies in a zip lock bag and use a tolling pin to crush them by gently beating on them. Do you leave the middle of the oreo cookie when makingvthe crust?? How do you think this would freeze?? Looks delish! I think it should freeze fine! Can I use Nestle Chocolate Chip Cookie Dough? If not I can’t find the no bake cookie dough in the stores! 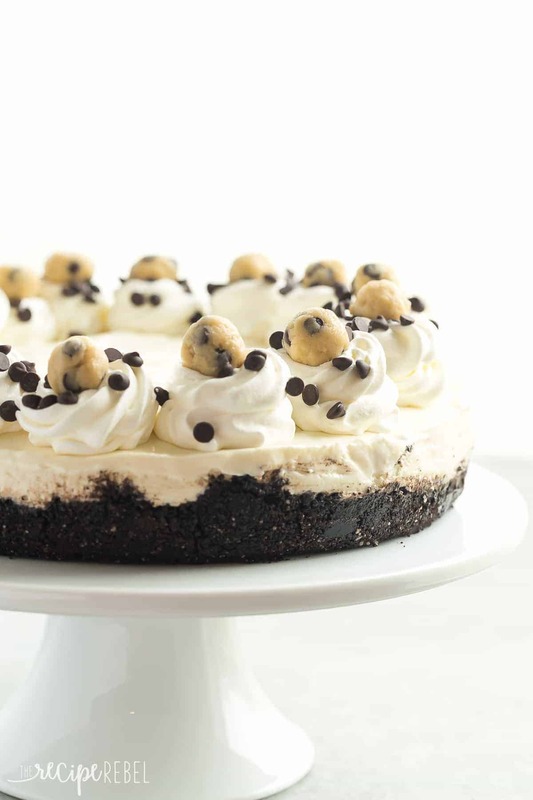 The recipe for the cookie dough is right in the cheesecake recipe. You do not buy it. she needs to buy the stuff to make the recipi the recipi its self on the site isnt going to make the cheesecake lol…. I am going to use a springform pan. Do I need to grease it first? Nope, not at all! Let me know how you like it! 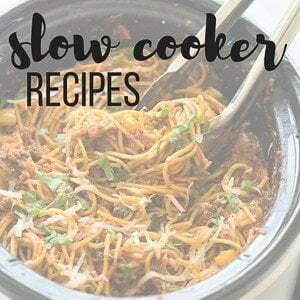 i just wanted to say thankyou for this recipe, i just finished making this , yes this late at night but it came out perfectly (: i will be following on instagram so i can try out more recipes ! Hi Taydra! I’m so happy to hear that! Thanks for coming back to leave a comment! any idea what the carbs are on the no bake chocolate chip cheese cake??? I don’t sorry! I will be adding some nutrition information to my main dishes and breakfasts but likely not desserts. They’re a splurge! A-ba-ga-zillion. And totally worth every carb! I have kitchen aid mixer. Which hooks do you recommend to use? I have the paddle for the cream cheese or the wire for the whip cream. I don’t want the cheesecake to be runny if I use the paddle but if I use the wire, it won’t mix the cream cheese nicely and smooth. I use my whisk for most things because it does get nice and smooth — you just have to make sure your cream cheese is room temperature and whip it on high, scraping the sides occasionally. Hello.. I don’t know if someone ask this question before but where do you buy no-bake cookie dough? The cream cheese must of been room temp before whipping ? It is easier that way, yes! Anything you eat could be contaminated — that’s the risk you take when you eat anything you haven’t grown yourself. You’re not supposed to eat half cooked eggs but people put them on everything. Can I use frozen whipped cream instead of cream? You could, just use double the amount of the cream and fold it in gently. What did you use for the top decor in the picture? Just whipped cream with cookie dough on top? Or is it a different type of whipped cream for the top? It’s just plain whipped cream! Do you leave the cream in the cookies for the crust or just use the cookies? Yes, use the whole cookie with the cream! Oh man! I only used the chocolate part and not the cream 🙁 mine also did not turn out as pretty as yours. Also when I was rolling the no bake cookie dough into balls they were so sticky that I had to put flour on my hands to be able to roll them into balls. Hi Jessica — how did it turn out in the end? Was the crust okay? I usually chill my cookie dough before I roll them for a bit so I will make a note. I hope it was still good and you enjoyed it! I accidentally used chocolate graham crackers instead of Oreos because I was confused. Was pretty crumbly, but still yummy. Filling was delicious, though!! I also found that the cookie dough layer slid apart from the crust. Did you have this issue? Maybe the Oreos made the difference here too. I think using the full Oreos would make a big difference! I’m glad it still tasted good! Can I use nestle cookie dough already made? No eggs in recipe at all. Someone please help!! Is heavy whipping cream the same as whipping cream? I can’t find just plain “whipping cream.” Doesn’t heavy whipping cream turn into butter if you beat it for too long? My grocery store doesn’t have whipping cream, only heavy whipping cream. Can I use that? What can I use if I don’t have a food processor to mix the cookies and butter? Great tip! Either of those would work great! Can you please answer my whipping cream question? 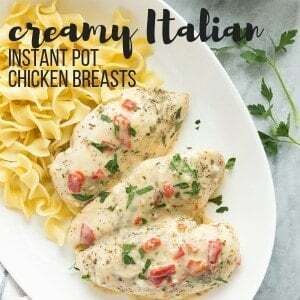 Can I use heavy whipping cream? I can’t find just plain whipping cream. Heavy whipping cream just has more fat. Heavy whipping cream is what you want to use, it will make for a creamier cheesecake. Either one doesn’t matter. So when you say 3 packages of cream cheese, you mean the 8 oz. package ps correct? So 27 ozs. Total? Thanks. How much cream do you put in cheesecake mixture ? Isn’t 3 8oz packages 24oz? Not 27?? So which is it 24 or 27? Kombinieren Sie geschmolzene Butter und Kekse in einer Küchenmaschine und Prozess, bis glatt und ein Ball bildet. Drücken Sie in eine 9 “Springform Pfanne (oder eine Torte oder quadratische Pfanne funktioniert auch gut!). In einer mittleren Schüssel, rühren Sie weiche Butter und Zucker mit einem Löffel zusammen. Fügen Sie Salz, Vanille, Milch und Mehl hinzu und rühren Sie, bis ein Teig bildet und ein wenig mehr Milch addiert, wenn erforderlich. Rühren Sie in Schokoladenstückchen. Set in den Kühlschrank zu kühlen. In einer großen Schüssel, zusammen schlagen Frischkäse, Sahne, Zucker und Vanille bis vollständig glatt und flauschig – ca. 5 Minuten auf hoher Geschwindigkeit. Den Teig in Drittel aufteilen. Bringen Sie 1 Drittel in einen Kreis der Größe Ihrer Pfanne und legen Sie oben auf Ihre Kruste (Ich tue dies zwischen 2 Blatt Wachspapier und es funktioniert perfekt!). Rollen Sie ⅔ in kleine Kugeln. Rühren Sie die Hälfte der Plätzchenteigkugeln in den Käsekuchen und stellen Sie den Rest im Kühlraum für garnieren ein. Top mit Käsekuchen-Mischung und legen Sie in den Kühlschrank zu kühlen, bis gesetzt, mindestens 4 Stunden. Garnieren Käsekuchen mit Schlagsahne, wenn gewünscht und extra Cookie Teig Bälle. Serve und speichern Reste im Kühlschrank für bis zu 5 Tage. How much cream cheese in weight please? 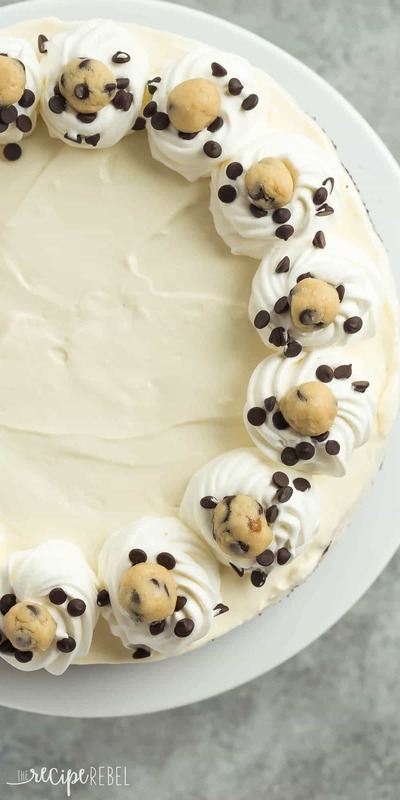 Looked for another cheesecake recipe and that specified 3 packages cream cheese (8oz each) so maybe if there is no other reply this would work…..
Cookie dough blizzards used to be my favorite, I’ve been a cookie dough addict forever now! This cheesecake looks absolutely unreal. I’m keeping this in mind for my birthday this year, because YUM! I’m all for cookie dough anything, too! I don’t eat it too much, but I sure do love it. And in cheesecake form…even better! Love the little chunks of cookie dough balls on top, this is my kind of dessert!